I just got an email from a friend who was looking for some inspiration for his own build. He send me this picture saying he quite liked it, well I don't blame him. The boso inspired exhaust really makes the rear pop. Super Street S13 is mega rad and the only Sileighty I don't want to kill with fire. I thought a sileighty was the coupe style body with the fastback front clip. It's a Dart Izumi exhaust... there's a sticker right above it. Rasputin - SilEighty is Silvia front end, 180sx body. 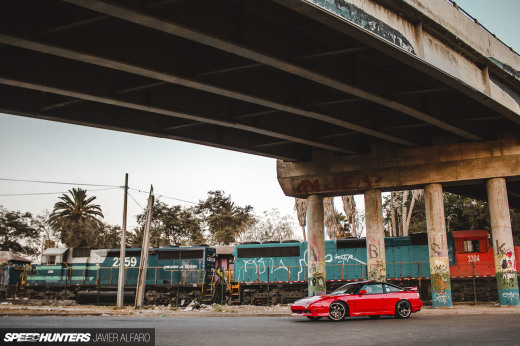 OneVia is the 180sx front end, Silvia body. its a silvia front end with a 180 back. the coupe s13 is a 240sx (or so it is called in north america) and the hatchback is called the 180sx. ur thinking of the other way around, which is just the 240sx coupe. took me awhile to understand the difference between a 180sx and a 240sx. @ Rasputin, that's a onevia.